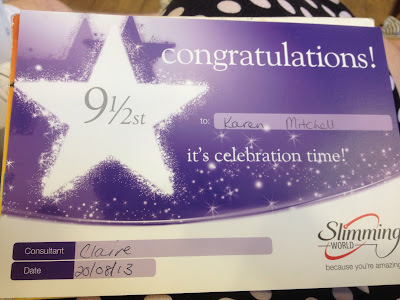 I am taking this journey one step at a time - which means 7lbs at a time :) So here are all the awards I've gained whilst I've been following Slimming World! Astonishing! Well done you, I shall take you up as my inspiration. I'm working towards my 40th, it is a tad closer than yours - on 25th Feb this year and I have another stone to go so I need to get cracking... Keep it up! How are you getting on Kati? Wow, how long did it take you to lose the four and a half stone? Curious as that is my target loss from where I am now. Awesome work! Well done. I too am approaching 40 rather more quickly that I would like (May 2013) and I want to lose about 8 stone. Not gonna happen by 40 but hey ho, you gotta try anyway. Good luck and keep up the good work. Wow!!! 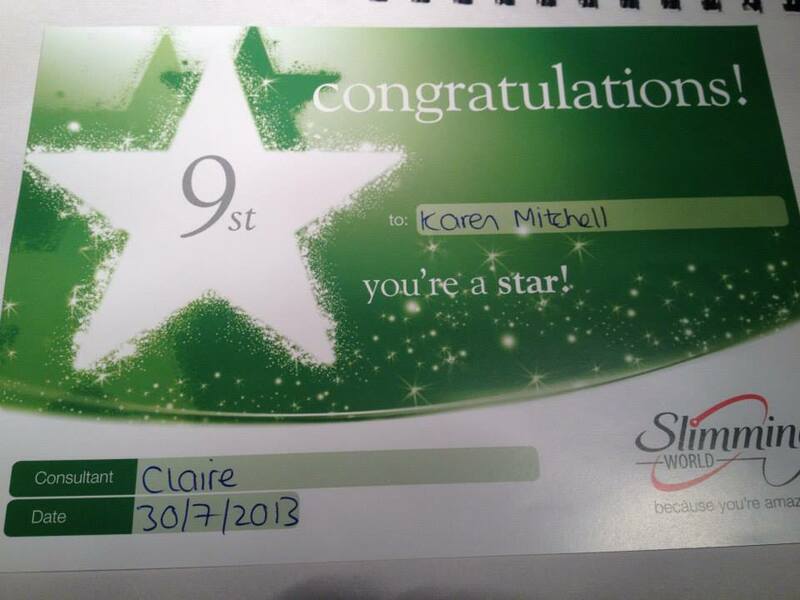 I'm on my first week, and absolutely determined that this is the last time I join Slimming world. Found your blog while googling (can't remember for what now as i have been transfixed in reading your blogs and lost track of 'why i came into the room' in the first place). Your achievements are inspirational and have given me even more pluck to get back on the horse. 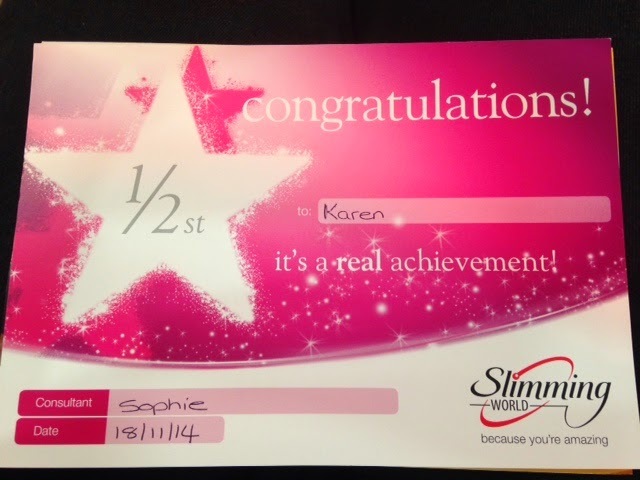 I managed to lose 2 1/2 stone on SW two years ago, but was then unable to continue with classes and started a new job and have put it all back on AND THEN some. I've been miserable and unhappy and displacing my miserableness at everyone and thing else and it's time now for me to just bite the bullet and do it again. The challenge for me is to find a meeting that i can attend. And one that does the whole session and not just a weigh in as I've tried them and they don't help at all. Just wanted to say thank you and congratulations. Wow Karen, thankyou so much for sharing your with us. You're such an inspiration and what fantastic awards you have achieved. Many congratulations on each and everyone of them. My daughter and I are going to SW group and so far daughter has just achieved her 1 1/2st award and I've reached my 1st award. thanks again for all your recipes etc. Brilliant, what a great achievement. It is inspirational to see someone doing so well! 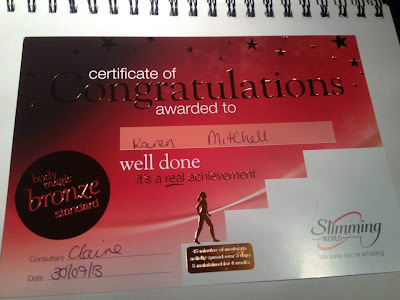 Truly amazing weight loss well done you!!! So many congrats been trying to comment but none of the profiles seem to apply to me, don't know why but will keep trying, your blog is wonderful very inspiring. OMG Karen. Absolutely amazing. Well done and congrats. 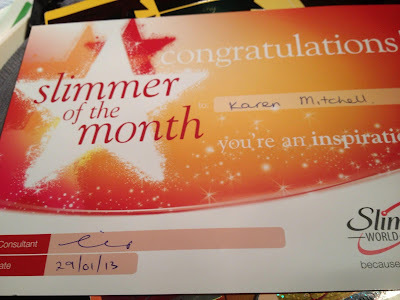 I started the slimming world journey at the start of this year. Seeing your awards have put me to shame. lol. Will be keeping a close eye on this blog. I just came across your fab blog, having just started SW. I just looked through your awards, wow, what an inspiring achievement!!! Hi, I just stumbled upon your blog whilst looking for the syn value of an ASDA yoghurt. Can i just say a huge congratulations and well done! Thank you!! You have just given me my mojo back. Came across you blog by accident and I'm so pleased I did. True inspiration. I started SW 5 weeks ago and have lost 12lb, got 4 stone to go, feel really dishearten this week, but reading your story has given me a kick in the right direction. Thank you and WELL DONE!